Taking Taxi from KLIA2 is not as straight forward as KLIA. The reason is because the airport taxi counter is located at Level 1, while arrival hall is located at Level 2. 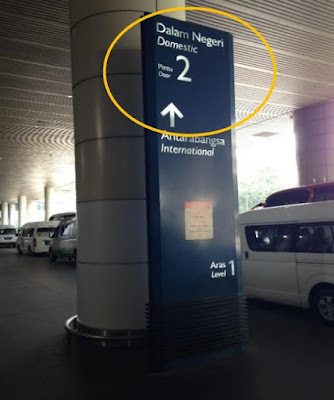 For this reason, when you get out from the arrival hall, look for the taxi signage which lead you to Level 1. First of all, look for the signage overhead. 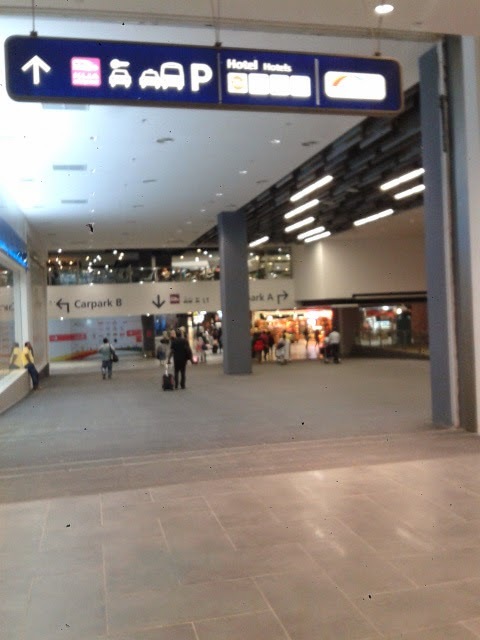 Upon coming out from the arrival hall, you can see overhead signage showing the direction to KLIA2 taxi counter. Upon coming out from the arrival hall (both international and domestic arrival, go in the right hand direction to go to the escalator to Level 1 for taxi. Don't worry if you get lost along the way. 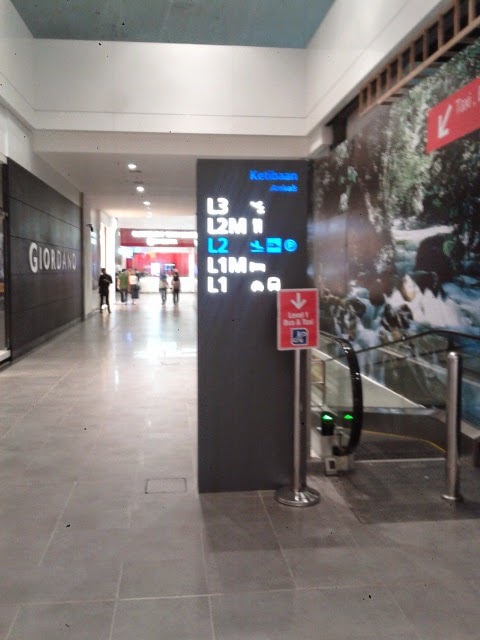 There are also additional signage stands on the ground of Level 2 (arrival level) to show you the direction to the KLIA2 taxi counter at Level 1. If you get lost, don't forget that you can ask one of the help personnel in blue T-shirt. It is not hard to find them in the arrival area. 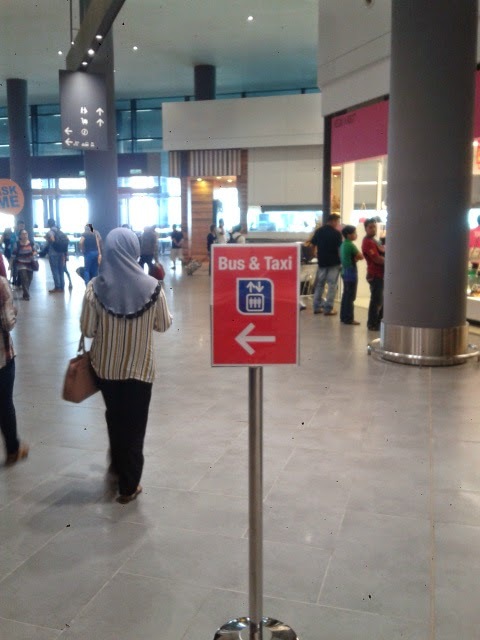 Additional signage stands showing the way to Taxi Counter at Level 1 of KLIA2. Follow the direction until you see this escalator with a Taxi signage stand next to it. There is a CIMB money changer and Giordano at the back of this escalator. You won't miss it. Take this escalator down to Level 1 for KLIA2 Airport Taxi Counters. If you are using the baggage trolley, do not use the escalator, use the lift nearby instead. Reason is because there is a pole at the escalator to prevent people from pushing the trolley down the escalator which, presumably, can be dangerous. 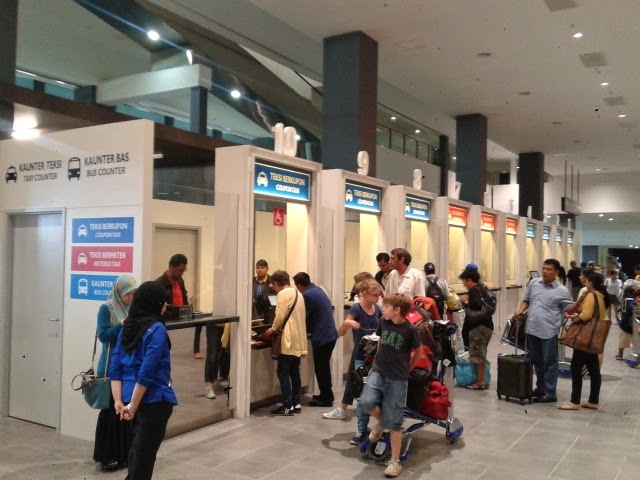 Upon arriving at Level 1 of KLIA2, you will be able to see a row of counters which offers taxi and car rental services. The first three counters offer taxi services while the rest are car rentals. Go for the budget airport taxi if you don't want to spend more for the limo. Buy the taxi coupon here at a fixed price depending on your destination. You do not have to pay the taxi driver or negotiate the rate with the driver. KLIA2 Airport Taxi Counter at Level 1. Should You Take Taxi from KLIA2? In general, if you are travelling alone, KLIA Express train is faster and cheaper because the one way ticket to KL Sentral is only RM35 or RM70 for return ticket. However, if you are travelling in group of 2 to 4, then it is more efficient to take a taxi from KLIA2. 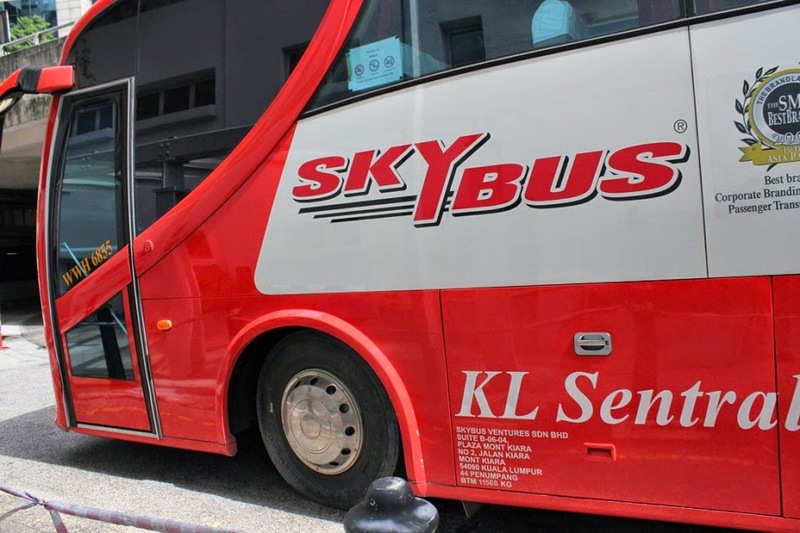 A trip to Kuala Lumpur down town is around RM70 to RM80 depending on actual destination. You can check the KLIA coupon taxi price at this website. Furthermore, the taxi will take you right from KLIA2 to the door step of your destination.